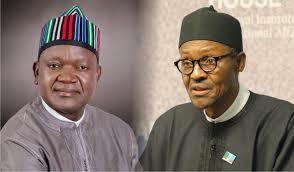 Benue State Governor, Samuel Ortom, has expressed that with President Muhammadu Buhari debilitated wellbeing, the country and in fact all Nigerians are sick. Ortom said he and six of his associates that went by the weak President in London a week ago prompted the Nigerian pioneer not to be in a rush to come back to the nation. He said the governors told Buhari, who left the nation on May 7, 2017, to remain back in the British capital until the point that he was totally mended. Ortom expressed this on Thursday in a meeting with State House journalists at the Presidential Villa, Abuja. The senator was a piece of the assignment of the Nigeria Governors' Forum that went to the President a week ago. He encouraged Nigerians to keep on praying for the Nigerian pioneer, saying, "Once the President is wiped out, the entire nation is wiped out." He said, “I was the first person that initiated prayers and I shouted halleluyah when I saw him because God has answered my prayers. I urge both Christians and Muslims to pray for Mr. President because that is our duty. “There is no power without God’s ordination. So those of us who are subjects should continue to pray. We should not be castigating Mr. President or wishing him evil. “Mr. President is doing well. When we saw him, he was not in a wheelchair, he was not bedridden. He greeted us, we cracked jokes and he was mentally alert. We discussed about the security situation in the country and he asked us questions about what we are doing. “Our prayer is that God will consummate his healing. We asked him not to hurry because there is no vacuum. The Acting President is holding forth for him and he is doing very well. By the grace of God, I believe that very soon, he will be with us.